Another BlackBerry Patent - Tilt and Slide | BlackBerry Blast! Here's another sneak peak at a RIM patent application. 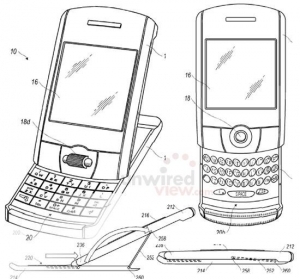 It appears they want to make the BlackBerry tilt and slide and have a touchscreen. The idea is to be able to use the BlackBerry in either position. The picture pretty much sums it up.